To start using Unity Multiplayer, your project must be set up to use Unity Services. Once you have done this, you can enable the Multiplayer Service. See in Glossary window by selecting Window > General > Services in the menu bar. In the Services window, select Multiplayer. This opens the Multiplayer Services window. The Go To Dashboard button takes you to the web-based Services Dashboard, where you can set up the Multiplayer configuration for your project. 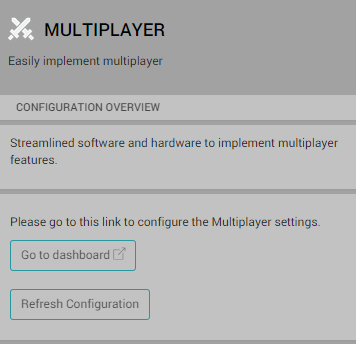 If you haven’t set up your project with the Multiplayer service yet, you are prompted to set up a New Multiplayer Configuration. To do this, enter the number of players you want per room and click Save. 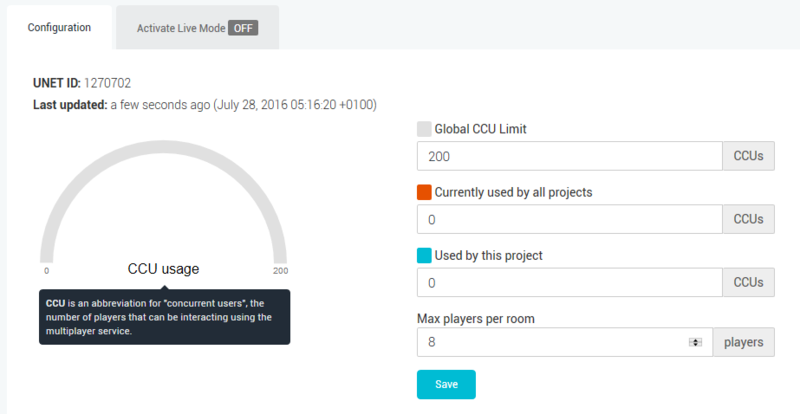 Once you have clicked Save, the Multiplayer Services Dashboard reflects your current project. You are now ready to integrate your project with Unity Multiplayer!